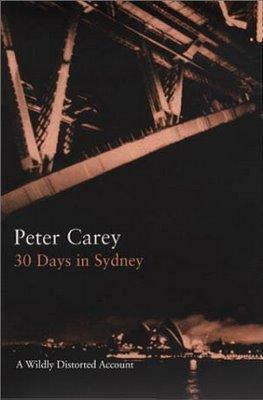 Peter Carey’s 30 Days in Sydney: A Wildly Distorted Account is one of the most accurately named books that I’ve read recently. This book is not a traditional travel narrative, and it gains so much from that. The twists and turns inherent in Sydney’s history and people are developed throughout the book not only in the words, but in the style of the book. It is indeed a wildly distorted account, and an unapologetic one. We are along for the ride with Carey’s spin through Sydney, a city he once lived in. Carey starts the book saying that he originally wanted to research the Earth, Air, Water, and Fire of Sydney, but he continually gets off track. There isn’t a clear and focused direction to the narrative; instead it’s a lovely and intense stream of consciousness. The tale wanders through streets and history of Sydney in a delightful and inspiring way. Settled as a town for prisoners from Europe, Sydney has a complicated relationship with its own past, particularly considering that there were already people happily settled and living in the area before Europeans arrived. The balance between the white settlers and the indigenous people is still a precarious but not often discussed issue in Sydney. The issue of land rights is touched upon, in a way that doesn’t beat a point over the reader’s head, but allows the reader to think for himself or herself. Carey looks at the landmarks of Sydney as he brings the story back (on occasion) to his specific focus of the four elements. We get to see Bondi Beach; we’re taken along a trek in the Blue Mountains; we survive a high intensity brush fire; we manage to survive a deadly storm on the bay. The culture of the area, including the corruption and scandal that is quietly endured and overlooked, is also highlighted in the book. Carey fully admits that there is no real way to accurately and adequately describe Sydney to someone who hasn’t lived there, but he does an incredible job of trying. Don’t pick this up if you are looking for dry facts and a straightforward narrative; pick it up if you want to be enchanted with Sydney, with history, with people and with story-telling. The book is a part of the Bloomsbury “Writer and the City” project, and I cannot wait for the next release in the series.